SINGAPORE- Being an air force engineer may seem like an unusual occupation for most girls. 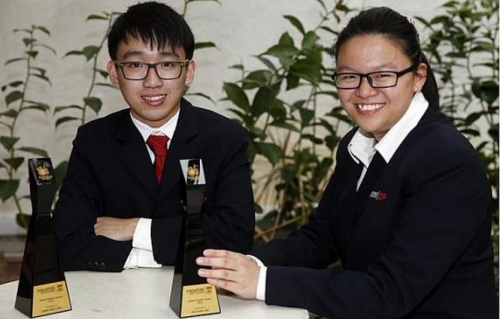 However, for Ang Wan Ling, 19, it is a childhood dream on the way to becoming a reality. The Aeronautical Engineering student from Singapore Polytechnic (SP) was one of 20 students honoured with the SP Model Student Award, which recognises students for their holistic achievements. Only selected students from the top 5 per cent of each cohort who have been nominated by the directors of their schools and undergone an interview will receive the award. Wan Ling, who signed on with the Republic of Singapore Air Force (RSAF), never achieved stellar grades in secondary school. "I was conditioned to think that I wouldn't make it, because everyone around me was talking about going to Junior Colleges, but I was one of the last few in class," she said. She decided to pursue Aeronautical Engineering as aviation has been one of her interests since young. She also joined the Aviation club in SP, and signed on because she "felt a sense of purpose" in defending the nation. Chew Keng Hao, 22, was another recipient of the award. The Visual Effects and Motion Graphics student stood out because he was older than his other coursemates, having gone to poly via the Institute of Technical Education. The aspiring filmmaker, whose favourite movie is In The Mood For Love by Wong Kar Wai, plans to go to the American Film Institute to further his studies, as well as develop his first feature film before entering National Service. He did an internship at Cornerstone Academy with 1Light Media in San Francisco for three months in 2014, and they liked him so much that he was invited back for three weeks at the company's own cost just one day after he touched down in Singapore. "I'm grateful for all the lecturers that have taught me, they are the ones who trained me into what I am today," he said.